In a meeting this week with the Guatemalan president, Paul blamed President Barack Obama's immigration policy for the humanitarian crisis at the U.S. southern border. The Kentucky Republican said the administration's ruling that allows certain undocumented immigrants to delay deportation ultimately motivated thousands of children to make the dangerous trek from Central American countries to the U.S. border. "I told him, frankly, that I didn't think the problem was in Guatemala City but that the problem was in the White House in our country, and that the mess we've got at the border is frankly because of the White House's policies," Paul told Breitbart News, referring to his meeting with President Otto Perez Molina. The first-term senator, also an ophthalmologist, was in Guatemala performing hundreds of eye surgeries with a group of physicians. His trip came amid a busy travel year for Paul, who's seriously considering a presidential bid in 2016. More than 60,000 children - mostly from Guatemala, Honduras and El Salvador - have crossed into the U.S. illegally this year, and officials expect that total to rise to 90,000 by the year's end. "I think what's happened at the border is all squarely at the president's lap. The problem and the solution aren't in Guatemala," Paul said. "The problem and solution reside inside the White House." The senator said he supports a package of proposals passed by House Republicans earlier this month that would limit the administration's 2012 policy, “Deferred Action for Childhood Arrivals.” The directive allows certain children and young adults who were brought to the U.S. illegally to defer deportation for two years. The House legislation would also tweak a 2008 anti-trafficking law, which was passed under George W. Bush’s administration and grants protections to children from Central American countries, making it difficult to deport them. Both policies - along with violence and poverty in El Salvador, Guatemala and Honduras - have been attributed as the primary causes behind this year's surge of children to the U.S. border. Responding to the DNC's comments, Paul's senior adviser Doug Stafford said the senator "did in Guatemala what he does every day in the United States - speak the truth. Career politicians and political parties don't get that, but the American people do." "If the DNC and the White House don't see that their shredding of the Constitution and abdication of responsibility for securing our border is the problem, they are the only ones," he added. Paul told Breitbart earlier this week that most of his meeting with the Guatemalan president was focused on his humanitarian trip. “I didn’t intend this to be a political trip,” he said. “But I’m happy to answer questions about what came up in the meeting." Speaking of criticizing the POTUS.... Has anyone heard anything from the Dixie Chicks since they were blacklisted??? "The first-term senator, also an ophthalmologist, was in Guatemala performing hundreds of eye surgeries with a group of physicians." The first-term senator, also an ophthalmologist, was in Guatemala with a group of physicians that has been performing hundreds of eye surgeries. Oh brother...and now there's a line of talking points out there being pushed by the Teatrolls in Iowa that 12-year-old child immigrants crossing the southern border are actually being highly trained in combat by terrorist organizations so they can infiltrate the US. Politics stopping at the waters edge? what about Obama's apology tour? he slammed the United States of America! What a joke! the rest of the world already knows what garbage is occupying the White House. this is not news. If parents are sending tens of thousands of unaccompanied minors to the U.S., there might just be some problems in Guatemala as well as DC. Odd that he didn't mention the fact that the Guatemalan government doesn't want the children returned. These clowns have no respect for this President because he is black so the racisism rolls along. I don't think any intelligent people can take immigration talk seriously from him, he nearly broke land speed records running from the issue, because they couldn't control the encounter. Now when king talked, he stood his ground, randy bailed like a car thieve on cops! -Rand Paul is not qualified to be a cook in WH, let alone presidency. He is a jerk. Don't shut down this Peter-Pan-looking excretion from the rightwing!! I want him speaking as often and as long as he likes. Now, of course the dimwit [R] base will be enlivened with his lies and fairytales. But these people are dumber than wet bricks, no matter what. No, I'm more interested in the 'sentient' America hearing exactly what new FAILURE these neo-Nazi ideologues, who feed at the teats of the rightwing underbelly, have in mind for our great country. Every election is an IQ test. And anyone voting for a [R] for federal office over the last 35 years has FAILED the test. Jefferson and our forefathers expected the country's governance to be informed by a knowledgeable electorate. Instead we now have about half the electorate knowledgeable only about the politically contrived fairytales that are concocted and screamed at them daily by their propaganda TV and radio stations, owned as they are by rightwing millionaires. The "morans" on the 'right' have been bought and sold, and they don't even realize it. Its one thing to be a slave, its quite another to be too stupid to notice it. First of all, Mr. Paul is factually incorrect (and he ought to know, the Senate actually passed an immigration reform bill which subsequently died in the radicalized House). Second of all, and much more troubling- the GOP has a long record of attacking our nation, its policies and its people abroad. I suspect it is part of their "break the government, then complain" action. Unfortunately THAT comes off as making the U.S. appear weak and divided abroad- and there are dangers associated with such behavior. This is the example of the GOP acting as agent provocateur- working against the better interests of America and Americans that I find so troubling. “Regardless of political party, we do not go abroad and slam our own because of policy differences"
Nice for the DNC to acknowledge that, yet Senator Obama done exactly that, slam the USA overseas, there was not a peep out of the DNC. 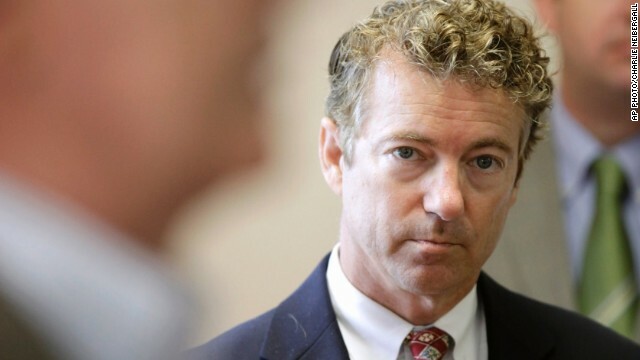 Rand Paul is tragic gift of hell to US politics. His next presidential campaign stop might even NK. No matter what randy says, you don't know what he really thinks, he has proven he only wants to tell you what poll tested good, then passes it off as his opinion. Well at least he's not going to be in prison, Christie would look so good in a hamburglar outfit! And Perry's new glasses could bring such an aire of sophistication to the joint, man, good stuff guys! Rand Paul has no difference from his fellow republicans. You hear Cheney and some of republicans slamming the President about Iraq. They don't think that it was their dire mistakes they made at the first place and make now Pres. Obama suffer the consequences. These people have no shame and rather I could say, they do not think at all. Politics stopping at the waters edge? what about Obama's apology tour? Earned him a Nobel Prize. Every election is an IQ test. And anyone voting for a [D] for federal office over the last 35 years has FAILED the test. Jefferson and our forefathers expected the country's governance to be informed by a knowledgeable electorate. Instead we now have about half the electorate knowledgeable only about the politically contrived fairytales that are concocted and screamed at them daily by their propaganda TV and radio stations, owned as they are by left wing puppeteers trying to fool the lemming fools that they care about them. The "morons" on the 'left' have been bought and sold, and they don't even realize it. Its one thing to be a slave, its quite another to be too stupid to notice it. nice to see obama benefited personally at the country's expense. "Jefferson and our forefathers expected the country's governance to be informed by a knowledgeable electorate. Instead we now have about half the electorate knowledgeable only about the politically contrived fairytales that are concocted and screamed at them daily by their propaganda TV and radio stations, owned as they are by left wing puppeteers trying to fool the lemming fools that they care about them." LOL. Meanwhile, studies showed that Faux viewers knew less about current affairs and were more misinformed about the major issues facing our country than people who reported not watching any news whatsoever (who were, of course, less informed than the people who watched other networks...altho that statement should be heavily caveated in light of the false equivalence and nontroversy paradigms on which the MSM operates). Too bad the facts are different: the states with the lowest educational attainment? Red ones. The states with the lowest per capita income? Red ones. States with the highest unemployment and poverty? Red ones. Thus it appears Republicans are stupid enough to vote against their own self-interests. Is that a dirty hair piece or just unclean implants? Acknowledging our role in Iraq was a CF was probably the least we could do as a nation- too bad no one on the Right will admit what an utter failure their policies and their President were.